Marvel at the historic sights of Madrid on this city sightseeing and Royal Palace tour. Learn the story of Madrid through its buildings as you travel from Moorish Madrid to the Habsburg and Bourbon eras of palaces and grand squares such as Plaza Mayor and Puerta del Sol. Admire the Baroque grandeur of the Royal Palace (Palacio Real) on a tour of the royal collections, and visit Madrid’s newest park, Rio Madrid. 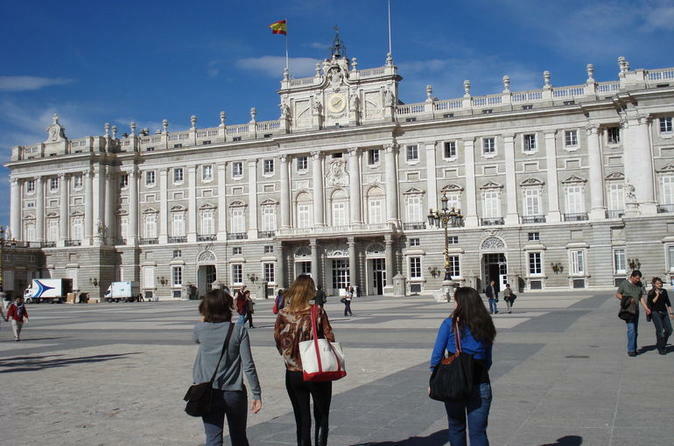 This tour shows you the very best of Madrid, and highlights the city’s sumptuous Royal Palace. Departing from central Madrid, discover the centuries of history that have shaped the city, from its Arab and medieval origins through to the present day. Learn about Madrid’s Moorish roots in the ancient buildings of the Barrio de la Moreria, the old Moorish quarter. Then take in the Renaissance and Baroque buildings of the Habsburg era in Calle Mayor, Plaza Mayor and Plaza de la Villa. Photograph the elaborate Baroque fountains, and see the famous Prado Museum. Then see the sights of contemporary Madrid’s graceful boulevards Gran Vía and Paseo de la Castellana. Admire the architecture of the elegant Barrio Salamanca and Parque del Oeste quarters, and travel through Madrid’s commercial and financial areas. See modern-day icons such as Ventas Bullring or Santiago Bernabeu Stadium, and take a walk around the city’s newest park, Madrid Rio, from Puente del Rey to Puente de Segovia. Take a breather at Madrid’s Hard Rock Cafe, and enjoy a free drink, then continue to Madrid's Royal Palace, the former home of the Spanish royal family. Built in classical Italian Baroque style in the 18th century, on the site of the ancient alcazar (Arab-fortress), it is one of the most beautiful and best-preserved palaces in Europe. Your guided Madrid palace tour places the building in its context, as part of the palatial complex encompassing the Plaza de Oriente, Sabatini Gardens and Campo del Moro. Your tour of the palace reveals the royal family’s exquisite collection of tapestries, porcelain, antique clocks, armor and artworks. Admire priceless paintings by Goya and Velazquez, visit the throne room, hall of mirrors and royal banqueting halls, and tour the private royal apartments. The tour also takes you through the royal armoury and pharmacy, and grand hall of columns. Your visit concludes outside the Royal Palace at approximately midday.